This low-growing spreader has pretty sunshine yellow flowers that grace the plant in the summer and stay through the fall. It stays under 1' tall and spreads impressively without being invasive. 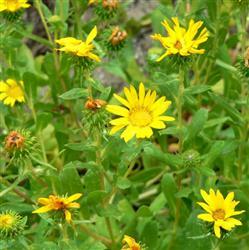 The leaves are fleshy and bright green, and the yellow flowers are dependable and long-lasting. A white, sticky milky substance can be felt when you touch the flower buds, this gives the plant its name and also protects it from predators.The flowers attract butterflies, especially the Skipper, so include it in your butterfly garden. Of course, it is a natural groundcover choice for a coastal garden where it will enjoy the relative humidity and tolerate wind and salt spray.